How can I programmatically insert values into Global custom text field from the views. I have tried using the $views variable from the hook_views_pre_render(&$views) and my_theme_name_process_function(&$vars) but was unsucessful in getting the value ? When I try for a simple field I can insert html into the markup programmatically. I want to similarly change the value of GLOBAL custom text field using views object but there is not such array for global custom text field. What is the way for changing it? How can I alter values for each row of global custom text field value ? The answer given below gives same values for each row . 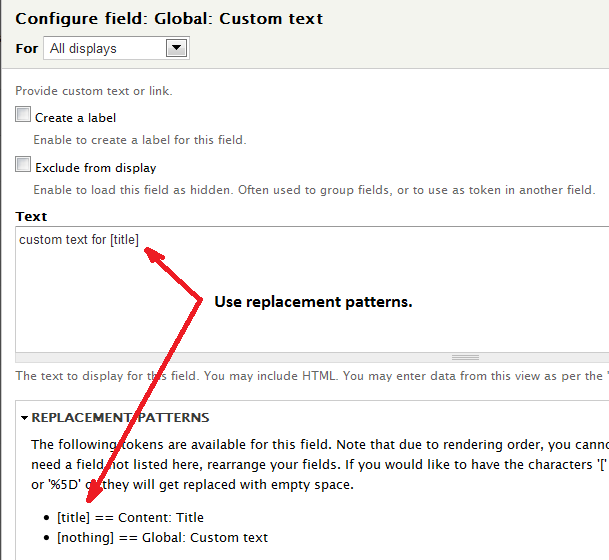 If the global custom text value need to be different for each view result, you can configure it using replacement patterns. Show field label when using tokens in “Global Custom Text” field in Views? How do I use inline CSS in “Global: Custom text”?